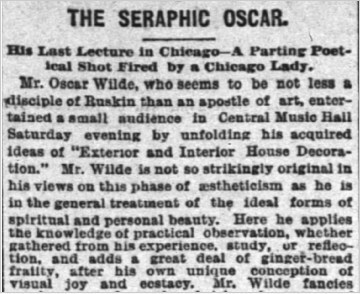 Just as Wilde's first visit to Chicago had seen a development in his lecture subject, so this, his second visit to Chicago, saw Wilde inaugurate a new, more domesticated, lecture. It became known as 'The House Beautiful' but it began life here as 'Interior and Exterior House Decoration'. 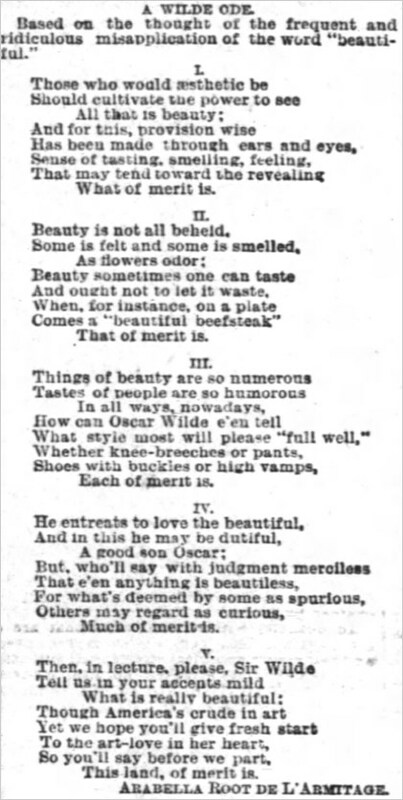 Later, and, confusingly, it was given the shorthand 'Art Decoration', with an occasionally longer more descriptive subtitle, such as in Philadelphia on May 10. The subject was a domesticated version of his general theme that focused on the beauty of handicrafts in the home such as in furniture, carving, and wallpaper. This was the first important building designed by Adler in which he made use of his knowledge of acoustics. 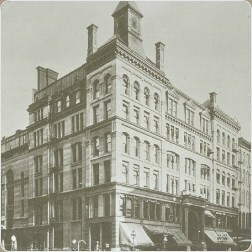 It was replaced in 1900, around the time Adler died, in order to build the Marshall Field & Company store, now Macy's. 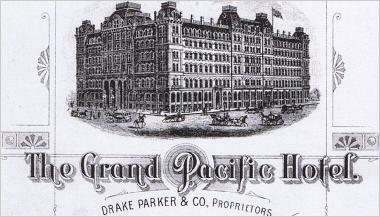 The Grand Pacific Hotel (1873–1895) on Clark, Quincy, LaSalle and Jackson Streets where Wilde stayed on his visits to Chicago. 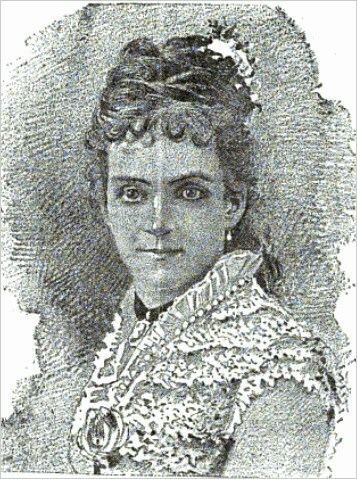 After first lecturing in Chicago on February 13, Wilde returned to the city on February 28 after traveling overnight from his latest lecture in Springfield. 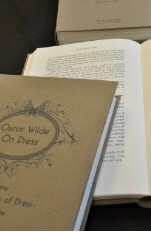 He took some time to rest—and also the opportunity to write to Walt Whitman to arrange a second meeting with the great American poet—before embarking on a series of lectures on eleven consecutive days in eleven midwest towns beginning in Dubuque on March 1. 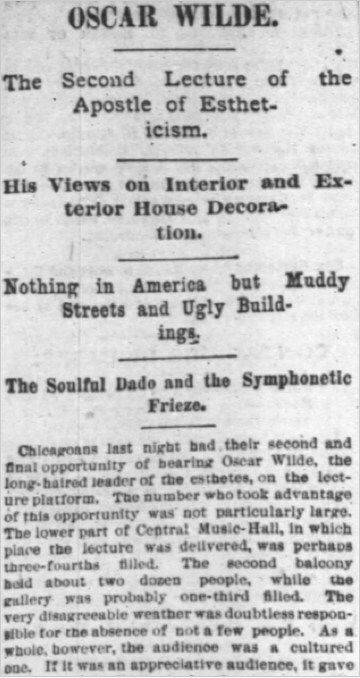 For this leg of his tour, Wilde made Chicago something of a hub, returning at least once to the Grand Pacific (e.g. on March 4th) before arriving back again on March 11 for his second Chicago lecture noted on this page. 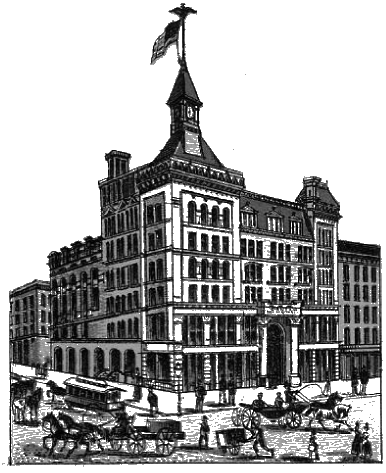 The hotel was built after the Chicago fire (1871) and was itself replaced by a hotel of the same name in 1895-98.